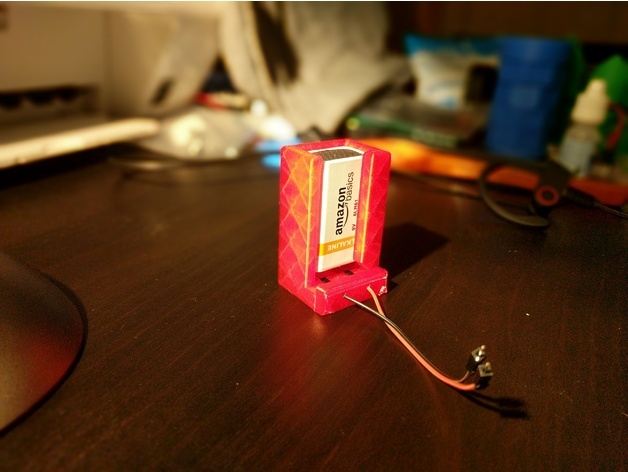 This a simple 9V battery pack/connector that allows you to power other projects or devices. It is particularly useful for powering Arduino’s or small circuits which require a 9V DC current. This print requires no glue to assemble. Just press the male ends of two jumper wires into their slots and slide in a battery, Then slide on the clip as shown in the pictures. Never buy a 9V connector again. Holds the battery securely against the leads for a reliable connection. To disconnect the battery from the circuit, simply slide the battery up. This disengages it from the leads, while still keeping it in place. No glue required for assembly. Note: Toleranced for a finely tuned Anet A8. If tolerances are too tight or too loose, try scaling the model by 0.5 – 1%.